Marking tribute to the 1000 years of Naropa, the five days long ‘Naropa Festival’ commenced on September 16 at Naro Photang. Before the start of the programmes, two minutes silence was observed and prayed for the swift reincarnation of the departed souls, HE Langna Rinpoche, and HE Lamchok Rinpoche. Naropa Fellowship program was launched on the same day. Dorjey Mutup, CEC, chief guest applauded organisers for coming up with the unique concept and appreciated HH Gyalwang Drukpa Rinpoche for the initiative of Naropa Fellowship. He said that the fellowship will not only help the children but will set an example of compassion in action. “Children should work hard and set an example for the rest of the world by availing benefit from such program by the Naropa Fellowship”, he added. He further assured to extend support by the Hill Council. His Eminence Thuksey Rinpoche, Co-Founder, Naropa Fellowship said, “Students of Ladakh have been constantly going to the other parts of the country as well as to abroad for their studies but we never had the amenities to encourage other students in our place for studies. The subjects that a child learns in schools are important but to learn discipline and compassionate life is equally important for peace and harmony”. His Eminence informed that the Naropa Fellowship began its first batch with more than 70 students from different parts of the country and the world. Congratulating the students, Thuksey Rinpoche said that the fellowship focuses on creating and nurturing agents of change who will work towards fostering an ecosystem of entrepreneurship and growth while preserving the cultural heritage of Ladakh and the Himalayan region. 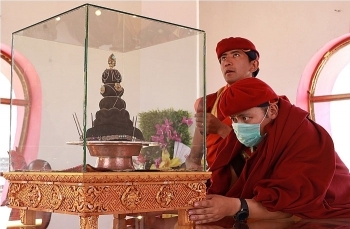 His Eminence Khamtak Rinpoche, Chairperson, Organising Committee of the Naropa Festival informed that the festival was organised this year as many of the devotees were not able to attend and seek the blessing of the holy Naropa Relic in 2016. Three books, ‘Musings from the heart’ written by HH Gyalwang Drukpa, ‘Meaningful to behold: The Biography of the Glorious Guru’ by Khenpo Shedup Tenzin and the 1st EDM Album of Ladakh titled ‘Rhythm of the stars’ were released. HE Gyalwa Dokhampa, Rinpoches from different parts of Ladakh and Bhutan, Ambassadors and deputy heads of mission of Embassy of countries of South Korea, Italy, Republic of Poland, United States, and Brazil, Representatives of HH Je Khenpo of Bhutan, and Royal Government, Kingdom of Bhutan, Thupstan Tsewang, MP Ladakh, Nawang Rigzin Jora, MLA Leh, Executive Councillors, religious and political heads and many other dignitaries were present. Live show of the famous singers of Bollywood, Bhutan and young talented artist of Ladakh mesmerized the evening. The Naropa Festival was concluded on September 20 with magnificent ‘Shondol Dance’ performed by 299 Ladakhi women dressed in traditional attire set a new Guinness Book of World Records.